We’re fully in Spring Break season, and the Disney California Adventure Food & Wine Festival and Get Your Ears on Celebration continue! How will they impact crowds? Read on to find out about this and more in this week’s Disneyland news. 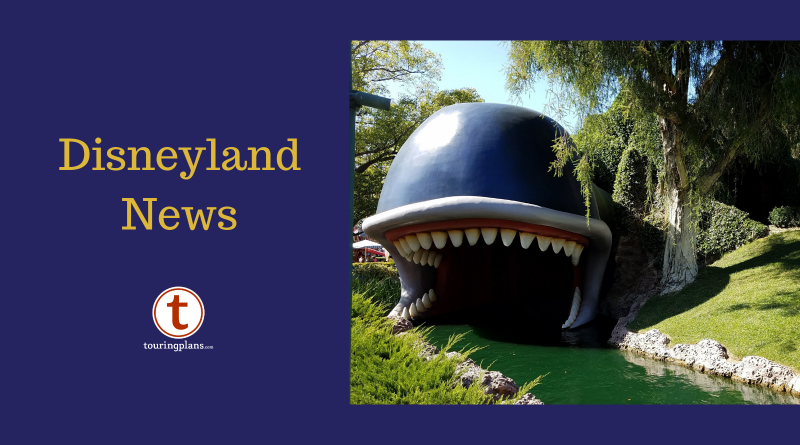 The Disney California Adventure Food & Wine Festival is the primary event going on right now, and it continues through April 23, 2019. This annual event includes culinary demonstrations and seminars as well as food kiosks featuring small bites and tastes, and is definitely worth a visit. There are several special events that take place during this event as well, including wine tastings, seminars, and special meals. For more details and information on how to make reservations (which are recommended), please check here. As per usual, the Annual Passholder corner will be passing out commemorative buttons and have special photo opportunities for Passholders. 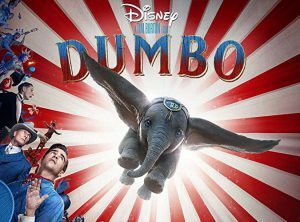 Also, Disneyland is currently running a sneak preview of the live-action remake of Dumbo at the Main Street Opera House. In addition to the movie preview itself, the exhibit includes a full-sized statue of Dumbo, plus costumes, concept art, and other related items. 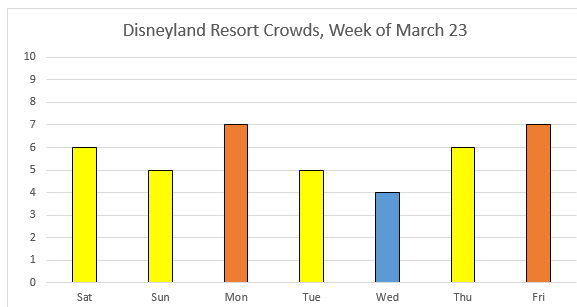 For a Spring Break week, crowds are surprisingly reasonable. We’re predicting Monday as the highest day, but even that is only level 7, and we’re predicting Wednesday at level 4. It should be a great week to visit! 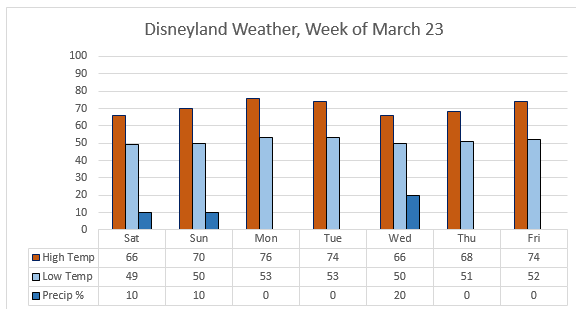 With highs in the 60s and 70s and only a scant chance of any rain, it looks like it should be a very pleasant week in Anaheim, if a little cool on a few days. Deluxe, Southern California, and Southern California Select Passholders are blocked out on Saturday, with Select Passholders also blocked out on Sunday and Friday. For those of you buying tickets as day guests, single-day tickets are Peak Price ($149/$141) every day. At Disneyland Park, Astro Orbiter and the Sleeping Beauty Castle Walkthrough remain offline for extended refurbishments, with Astro Orbiter scheduled to return on April 5. Over at California Adventure, Grizzly River Run is will be returning March 29. The Silly Symphony Swings are likewise offline indefinitely — we’ll let you know when we have a projected end date — and the Red Car Trolley is scheduled to begin refurbishment on April 1.